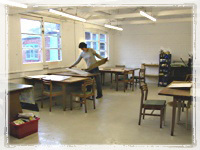 The studio was founded by Lesley Warren and Louise Green in November 2002. Over the years the studio community has grown steadily as artists like Caroline Holley, Juliet Heatley, Samantha Groom, Gill Gathercole, and Lena Papapanagiotou have become involved. It is now a well-established space for the creation and teaching of art. As from September 2010, Lena Papapanagiotou has taken over the management of the studio and is running it as a lively space that promotes art activities as well as her own practice. A recent addition to our community of artists is silversmith Sophie Williamson, who specializes in personalized bespoke jewellery. An important aim of Hangingwater Studio is to encourage people to access art and culture and support individuals to maintain and improve their artistic skills and interests. Art classes run by our professional artists are available throughout the year and enable people to become active members of a group, form friendships and enjoy themselves in a relaxed, secure and well organised environment. 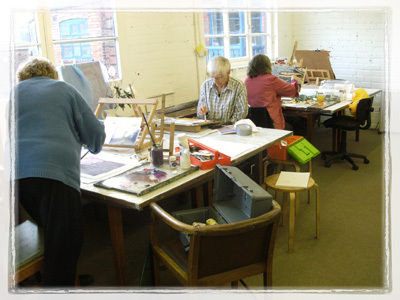 Some individuals also manage and run their own Art groups at the studio, inviting visiting artists along for a more varied teaching experience. 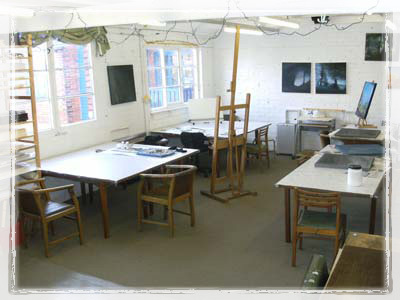 The studio is housed in a block of Victorian workshops in Fulton’s Yard, just off Nether Green Road. It is situated on the upper floor of the block—above the garages—with easy access from an uphill path on the right of the yard. The main studio area where the groups meet is a large, light and airy space of 45m², which seats 10-12 people comfortably and has plenty of storage space. In addition, the studio is equipped with a kitchenette for making refreshments and a W.C.